> Connor Knapp and Chris Wideman have survived the first round of cuts at the USA Junior Evaluation Camp in Lake Placid, New York. The RedHawk sophomores are just two of the remaining 29 players selected by USA and UNO head coach Dean Blais to remain in camp. The original roster of 42 players was trimmed on Sunday evening. Team USA will take on Russia four times this week (Tuesday, Wednesday, Friday, and Saturday) at the Olympic Center, in Lake Placid. Invitees are hoping to earn a spot on the U.S. National Junior Team that will take part in the 2010 International Ice Hockey Federation World Junior Championship, Dec. 26, 2008-Jan. 5, 2009, in Saskatoon and Regina, Saskatchewan. To view the current US roster, click here. > The 2009 NHL Entry Draft has wrapped up from Montreal and four future, or present RedHawks had their names called. 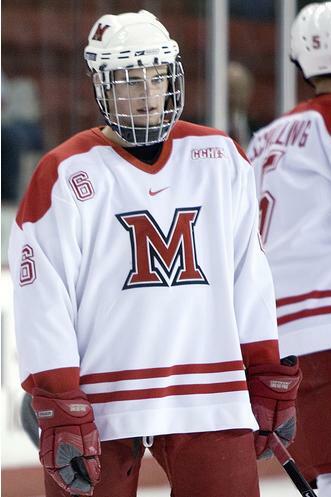 The first to go, was 2010 commit Reilly Smith, a winger, drafted by the Dallas Stars in the third round (69 overall). Smith, who played last season for the St. Michael’s Buzzers in the OJHL, was originally ranked at number 158 on the NHL’s Central Scouting list. His selection at 69 is a jump of 89 spots. AT 6’0, 157 Smith has good size, but desperately needs to fill out a his frame. Dallas made it clear that the wing was an area of concern, selecting 4 wingers out of 5 picks. Next to go, was sophomore defenseman Chris Wideman, selected by the Ottawa Senators in the fourth round (100 overall). Wideman, who quarterbacked the CCHA’s second best powerplay in 2009, will surely be on the Sens “watch list,” as they’re steadily rebuilding a solid D-corps. His puck moving abilities are a must have on every NHL roster. Look for Wideman to continue to improve in the following years. No action for Miami in the fifth round, however another winger, Curtis McKenzie, set to join the ‘Hawks in the Fall, was also taken by the Dallas Stars, only in round 6 at 159 overall. He led the Penticton Vees of the BCHL in scoring this season, with 33 goals and 41 assists. McKenzie is considered to be a two-way power forward who is strong in front of the net and in the corners, but can also score goals and has great size for that, at 6’2, 192. Last to be taken was sophomore goaltender Connor Knapp, by the Buffalo Sabres in round 6, 164 overall, just five spots down from McKenzie. Knapp was ranked number 19 on the list of 31 North American goalies that are draft eligible. In his freshman campaign, Knapp posted a 13-5-3 record and a 2.09 goals against average and will fit nicely in a Buffalo organization with a dwindling supply of ‘tenders in the system. Knapp, along with Wideman, will be attending the USA World Junior Evaluation Camp in August. Knapp was half of one of the nation’s best goaltending tandems this season. Though he played in just one post-season game, Knapp was an integral part of the RedHawks success this season. He was named to the CCHA All-Rookie team after posting a 13-5-3 record that included three shutouts in 23 games. Knapp is a towering goaltender that is remarkably agile. He utilizes his large frame very well and is excellent in his positioning. Knapp’s rebound control, especially on second and third opportunities, is also quite good. He possesses good lateral movement too. Knapp is very focused and poised in playing his position. Though his puck handling has improved over the course of the season, it is an area that he will need to continue to work on to be successful at the next level. Click here to see which other NCAA players made the list. > The CCHA All-Rookie team has been announced…and two RedHawk newbies have made the cut. Freshman defenseman Chris Wideman (my personal favorite) and goaltender Connor Knapp were selected to the annual squad. Chris Wideman, a 19-year-old defenseman from St. Louis, Missouri, and Miami University led all CCHA rookie rearguards with 22 points, finishing third among all rookies and third among all CCHA defensemen. Wideman’s 22 assists in 27 conference games was best among rookies and tied for second place overall. He finished second among rookies with 14 power-play points, sixth overall, and was named CCHA Rookie of the Week once. 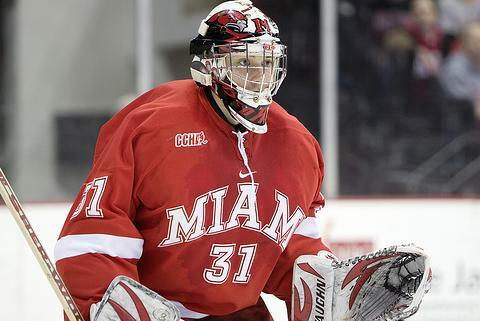 Connor Knapp, a 18-year-old goaltender from York, New York, and Miami University, posted a 12-3-2 record in conference games, third among CCHA netminders and first among rookies with a .765 winning percentage. Knapp’s 2.02 goals-against average was second among rookies, fifth overall and he placed third among freshmen netminders with a .908 save percentage. Congratulations to both! I’m certainly looking forward to seeing Knapp get more time between the pipes next season, and the remainder of this season as well. As for Wideman, this kid can run a power play with the best of them. I love watching his play on special teams. >Wow…what a conclusion to the first half to the season, with a 7-1 win over RPI today. I think the question of “is this a rebuilding year or a reloading year” has most certainly been answered, given our play thus far. I for one would have never thought we’d be one point out of first place in the CCHA, with a 12-3-3 record and four consecutive weekend sweeps going into the New Year. What a nice surprise that is! So, there you have it. Our ‘Hawks are off until 2009, where they’ll meet the Clarkson Golden Knights, along with Army or Ohio State at the Ohio Hockey Classic, in Columbus. In the new year, the RedHawks get right back into it with a weekend series at Michigan, followed by a Michigan State homestand and then a trip out west to Omaha to take on the Mavericks. Another thing to keep in mind: The end of season home and home with Ohio State may indeed have meaning this year, as the Buckeyes, led by the stellar play of Dustin Carlson, are lurking in 6th place in the CCHA with a record of 11-6-1. I certainly didn’t see John Markell getting 11 wins out of that team the entire season. It’s sure to be a great matchup, come late February. 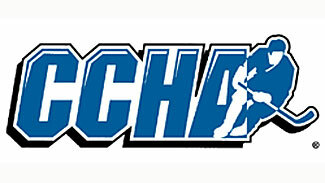 – The Spartans were picked to be near the top of the CCHA, led by veteran goaltender and team captain, Jeff Lerg. This young MSU squad is 0-9-1 in their last 10 games. Next up for the Spartans, the Great Lakes Invitational on December 26. – The Wildcats have also been struggling as of late, going just 1-7-2 in their last 10 (not counting an exhibition win over the USNDTP this weekend). Projected fourth in the preseason coaches’ poll, Walt Kyle’s ‘Cats have quickly fallen out of CCHA title contention and will most assuredly go on the road for the first round of the playoffs. – One of the hottest teams in the country now…imagine that, the Buckeyes! OSU has strung together a 9-1 record in their last 10 with a solid weekend sweep in November over a very good Nebraska-Omaha squad. In the new year, conference play for the ‘Bucks has tight matchups at Bowling Green, at Ferris State, home with Western Michigan, and a long trip to Alaska. OSU is certainly a team to watch and very well could make it’s way into a top 4 finish. Who would you hand out awards to, based on first-half play? Wideman (0-4-4) assisted on the game-winning goal in Saturday’s 4-2 win at WMU before setting up three more goals in Sunday’s 7-3 victory over the Broncos.